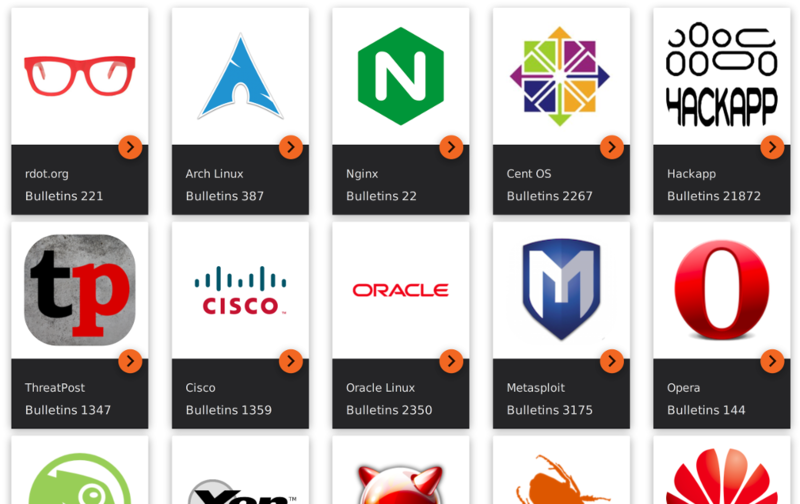 Full list of vendors, articles and databases supported by Vulners you can see at https://vulners.com/#stats page. Unlike other security databases in which information is stored in a highly formalized form (for example in OVAL-based CIS, SecPod and Altx-Soft databases), Vulners data format is much more flexible. This makes it easier to add different kinds of sources and establish connections between all entities in the database automatically. Vulners provides fast search mechanism and presents search results in a nice form. What to do next with this information depends entirely on end-user’s fantasy. Who makes Vulners and what is under the hood? Alexander Leonov writes articles and makes analytics. The first version of Vulners was rolled out in a couple of months after beginning of the development and was presented at Black Hat USA 2015 conference in Las Vegas. In June, the project celebrated it’s first anniversary. 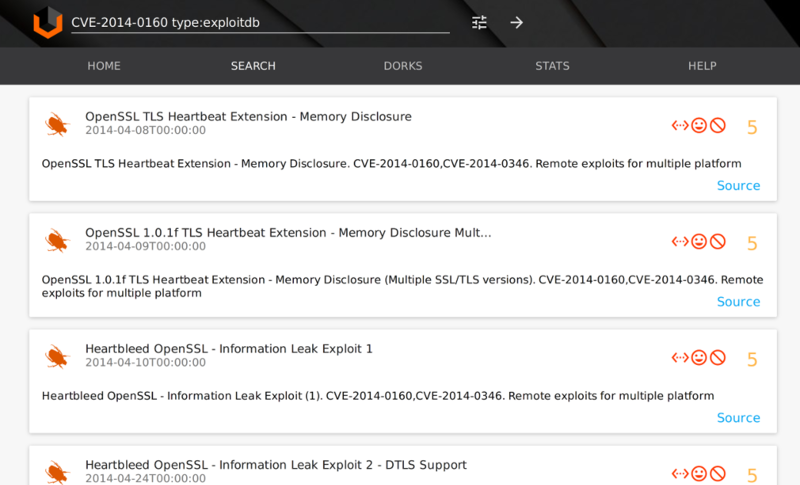 Vulners engine is written in Python + Django and uses MongoDB + Elasticsearch databases. 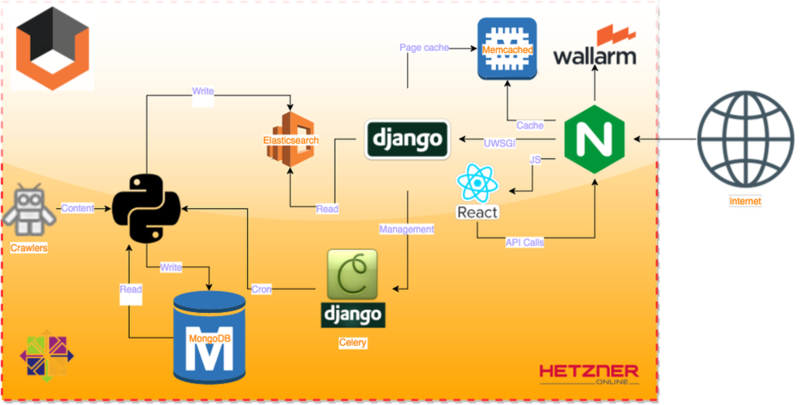 MongoDB is used only by data collecting robots, Elasticsearch is used only by front-end. Deploy is made with Bitbucket script. Scaling is released directly in the kernel through MongoDB and Elasticsearch sharding. Robot factory does not depend on host and may work away of the project. One of the coolest pieces – project uses Python 3.5+ and asyncio. That’s why search operations always work very fast :). Vulners contains 319,557 bulletins and 144,684 exploits. Database size is less than 2 GB. This compactness is achieved by deduplication and packaging. All data is stored in RAM and this increases search speed greatly. It is worth mentioning that Vulners is protected by Wallarm WAF operating in blocking mode. The first thing you see when you open Vulners.com is, of course, the search string. Just enter the name of the application, website URL or vulnerability CVE number and Vulners will give you all latest publicly known bugs of the product with links to exploits, detection plugins and various publications. Of course, it’s boring to search something simple like «wordpress» or «xakep.ru». Let’s see what interesting things that Vulners can do. 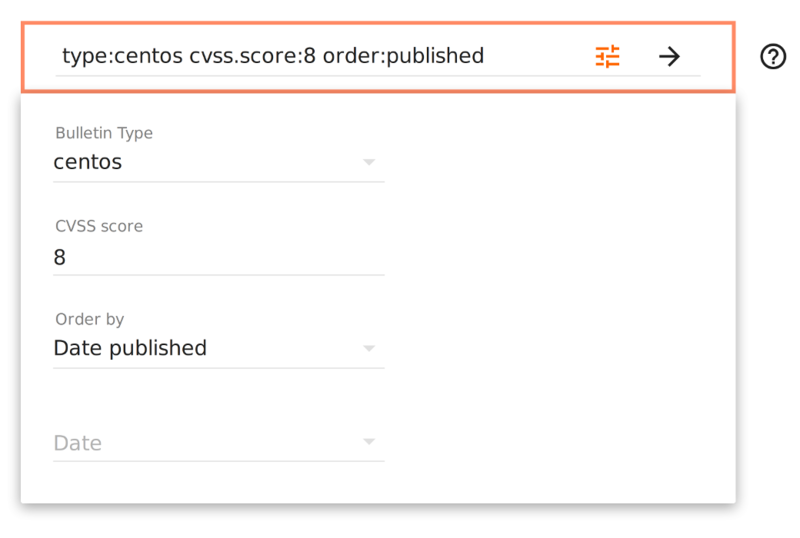 That’s why we can form a complex queries like “type:centos cvss.score:[8 TO 10] order:published“, which means “find all new critical CentOS bugs, with CVSS Base Score from 8 to 10”. 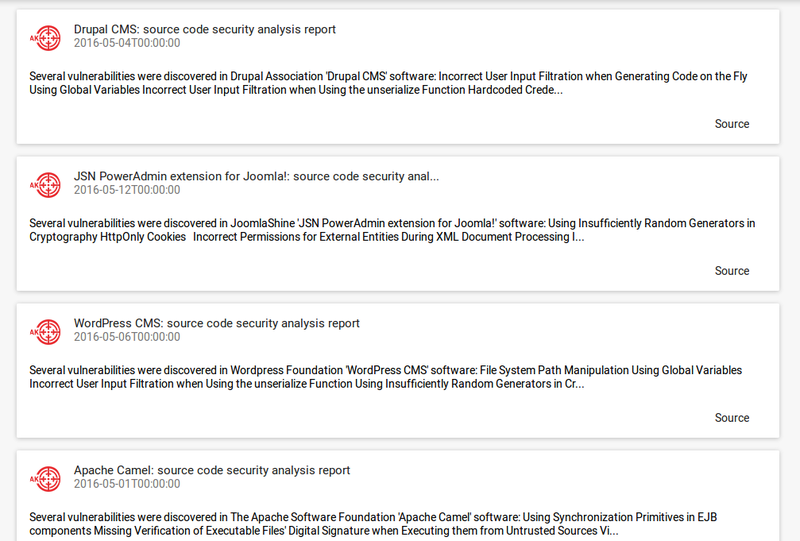 Since Vulners automatically add links to all collected data, you will see all related CVEs, detecting plugins, and exploits on every CentOS CESA bulletin page in search results. Search results for this query can be obtained via Vulners API – it is may be useful for scripting. You just need to make a GET-request https://vulners.com/api/v3/search/lucene/?query=type:centos%20cvss.score:[8%20TO%2010]%20order:published. The answer will be in JSON. By default Vulners returns only first twenty objects in the search results. If you want more, you need to set the parameter size. So you can get up to 500 objects. And if that’s not enough, you can request several times by 500 using parameter skip. With Vulners it is relatively easy to explain IT-department why vulnerabilities detected by the scanner are really dangerous and should be patched. To do this, you can display a list of exploits found by the CVE number or by another identifier. You can search in Exploit-DB or Metasploit. On the exploit page, full description and the source code of the exploit will be displayed. You can see full text of the exploit in a convenient web editor. Bug bounty search is an unique Vulners feature. You can find out which vulnerabilities were reported by the researcher and see his achievements in the bug bounty programs. Results can be sorted by company, researcher, price and so on. You can also look for real SQL-injection vulnerabilities or vulnerabilities on a particular web-service, such as Vimeo: type:hackerone Vimeo. Nessus plugin search is also a unique feature Vulners. Query will display a list of recently added plugins. Another cool Vulners feature – the ability to search for vulnerabilities in more than 13,000 free Android apps from US Google Play! Store through HackApp base. HackApp – is shareware toolkit and service for analyzing mobile applications. The search results contain bulletin title, number of vulnerabilities by severity (red circle – critical, yellow circle – medium, gray circle – notice), information about the application (icon, current version, vendor name and release date). The bulletin contains brief description of vulnerabilities, vulnerable version of the application and a link to full version of the report on hackapp.com. 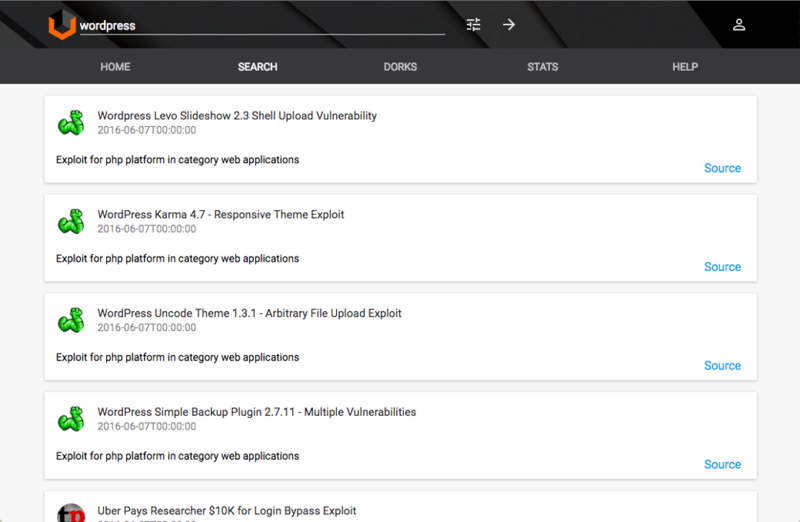 With Vulners.com you can search for potential vulnerabilities in the popular CMS and plugins. Application source codes are checked by InfoWatch APPERCUT static source code analyzer. It is generally known that the most exploited vulnerabilities are not in CMS engines, but in thousands of third-party plugins. Developers rarely fix this vulnerabilities quickly or even don’t fix them at all. 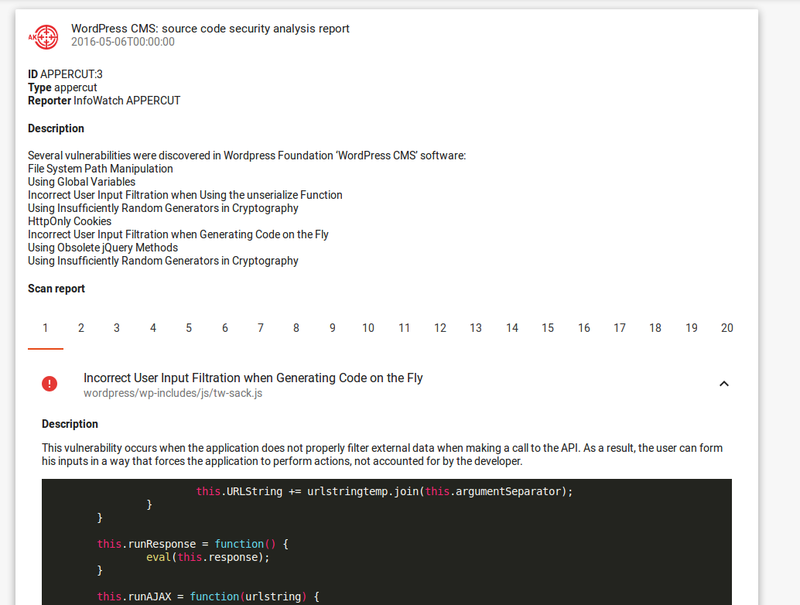 You can find examples of such vulnerabilities and exploits with “wordpress plugin bulletinFamily:exploit” request. Appercut bulletin contains all information about found vulnerabilities, including vulnerability description, criticality and a piece of code where the vulnerability was detected. Vulnerable version of the application is also indicated, e.g. “WordPress CMS <= 4.5.2”. Vulners archive/collection call provides an easy way to export whole collections of security bulletins. 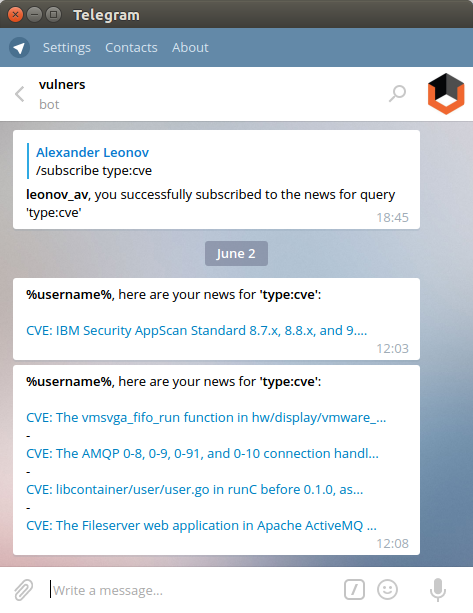 In April Vulners launched a bot for Telegram messenger. It is very simple in use. Send “/subscribe your_search_query” message to a bot and get new search results as they would appear on Vulners. Bot understand the same queries, as the web search. Operation guys can track vulnerabilities in the software they use. Penetration testers can receive information practical use of vulnerabilities. Do you want to see updates on the exploits? 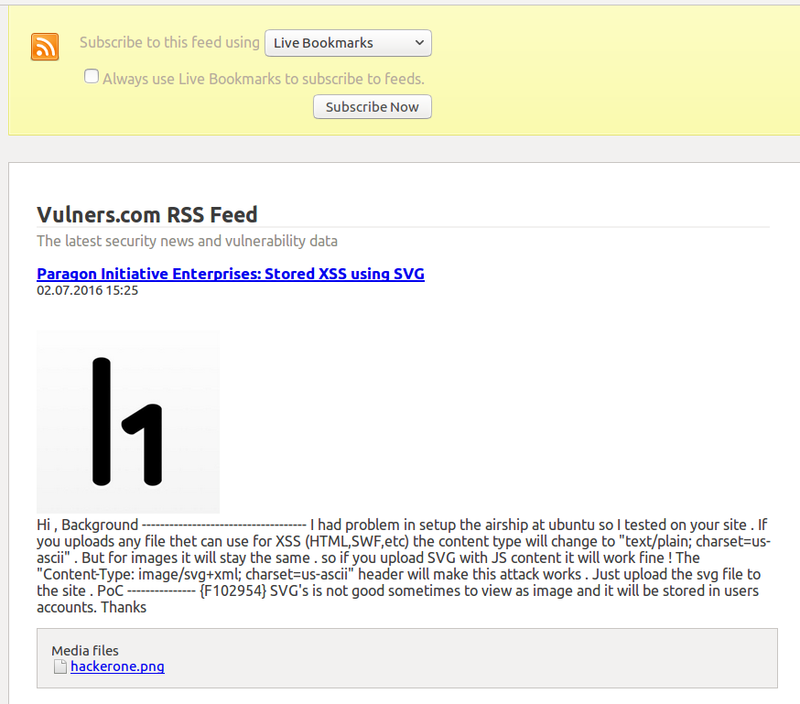 Add this link to the rss-reader, and receive alerts on a new results. What about alternatives to Vulners? Vulners is not the only vulnerability aggregator. We can mention, for example, OSVDB and Secunia databases. But one OSVDB is closed since April 5 and the Secunia became a paid one. It can be said that unfortunately there are no yet alternatives comparable by amount of sources, data formalization and automation capabilities. We can also look at the problem from the Vulnerability Intelligence perspective. 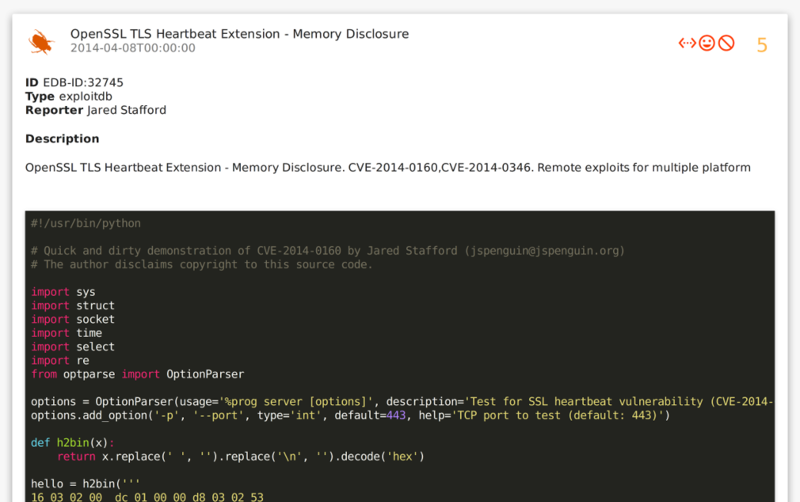 I recently wrote a post about this class of solutions “PCI DSS 3.2 and Vulnerability Intelligence“, including Vulners. So, if you are interested please read it. Vulners is a unique and indispensable tool for any hacker and security expert. It is very time-saving in exploration and exploitation of the complex attack vectors. Of course, the tool is only in developing stage, but even now it is quite usable. And more importantly, Vulners open and free for the end user and will always be. 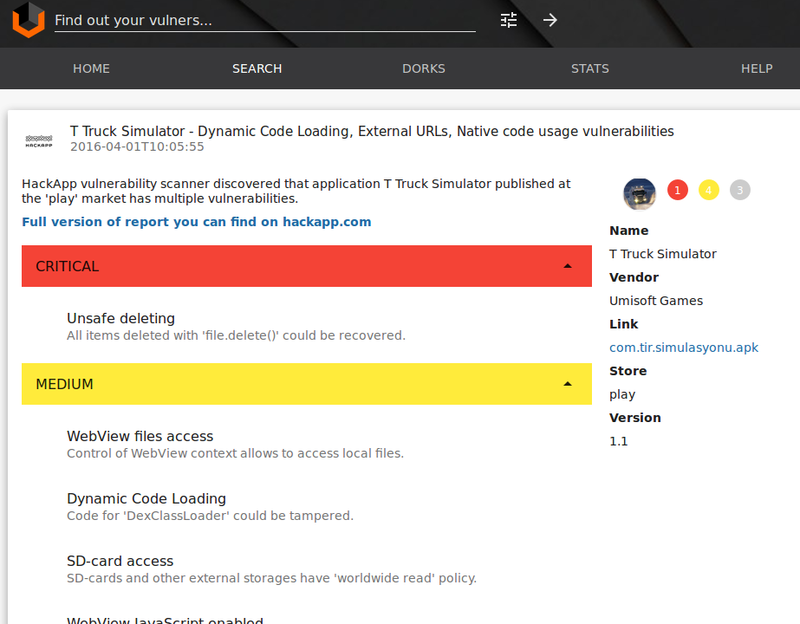 By the way, vulners.com vulnerabilities, can be submitted on https://hackerone.com/vulnerscom. Since the project is free, there are no rewards, but Vulners developers guarantee public disclosure. Email for communication support@vulners.com, other contacts here https://vulners.com/#contacts.